Many people are led to Psychic Light not just for personal support, but for advice on how to help out a loved one or friend in need. 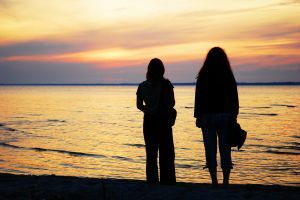 When a friend is in pain or grieving it can be a hard time for both of you, and you may not know the best way to approach the situation. Many people push away their support system when they are going through a hard time but it is important that you are there to support and be strong for your friend throughout their grieving process. If they have lost something or someone important, whether it is the death of a person they love, a relationship breakup, or loss of health or a job they might go through emotions such as anger, depression and denial. It can be a stressful experience to watch someone you care about go through these stages but we can give you some tips to make sure you are able to be there to support them throughout. It is important to understand that the grieving process is completely natural and if you have not been through it yourself it can be unfamiliar and even scary to experience someone else’s grief. The more significant the loss the person has gone through, the longer and harder the grieving process might be so be prepared to stick by their side no matter how long they need you. There is no normal timetable for grieving and it’s important to be patient and recognise what your friend is going through. Just talking things through may make a huge difference, and once they have got things off their chest they may be willing to spend some time taking their mind off things. Often, a good way to do this is through exercise. Encouraging your friend to keep looking after their physical health can have a huge impact on their mental state. The mind and body are connected and exercising, eating right and getting enough sleep can all have a positive effect on their mood. Finally, if you can, plan ahead by writing down ‘grief triggers’. Anniversaries, holidays, dates and milestones can all bring back bad memories for your friend and if you are prepared for these times then they will appreciate you being there to take their mind off it or to just be a shoulder to cry on. Keep communication open with your friend and make sure they know you are always there as they move through each stage. It is common for people to avoid their loved ones during tough times in their life and push away the help that is offered to them. If this sounds familiar and your friend is unwilling to talk to you or anyone close to them, then talking to a reader from Psychic Light could give them the support and advice they need, without the pain of talking to someone they know. We have many experienced and knowledgeable readers who can help counsel your friend through the grieving process, allowing them to talk through the intense emotions that are connected with grief and help them to eventually overcome the obstacles to move one. Also keep in mind that Psychic Light are also here for you if you need advice on how to comfort your friend. You may be the only person your friend can talk to and it can be a stressful and emotional time for you as well. Our readers can give you advice on how to cope and help you to look after yourself at the same time as supporting your friend.